My wife, myself and our 2 children stayed here for 2 weeks. We invited 5 more couples who all brought their children resulting in a total party of 12 adults and 18 children. After arriving we weren’t just surprised, but completely blown away. 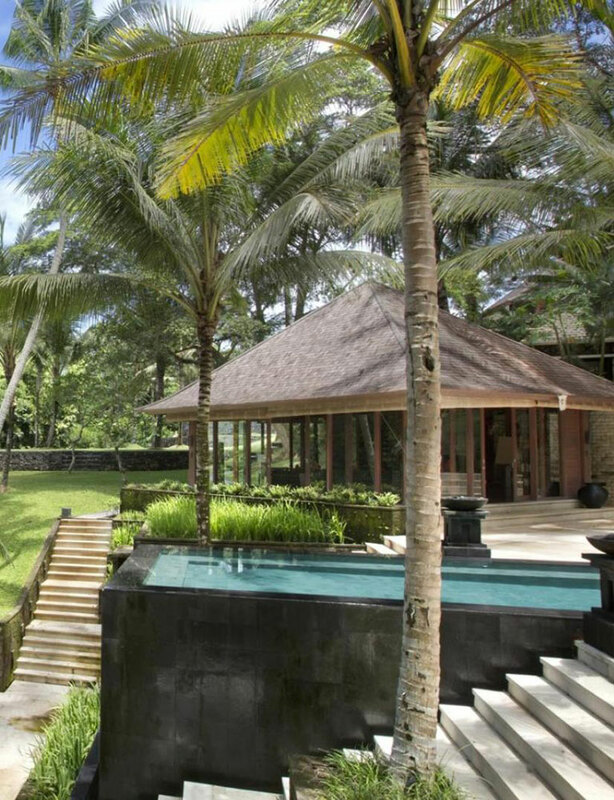 The resort, being built on the side of a small valley, has simply magnificent, uninterrupted views looking out a hidden paradise, while looking hard left and right you are immediately aware that you are buried in the Balinese jungle. I really can’t find the words to describe this because there aren’t any. You have to see it to appreciate it. We were fortunate enough to have found excellent clear weather, which helped. Temperatures were in the low 30’s Celsius, and humidity would have been around a tolerable (for this location and time of year) 70-80%. The Sanctuary has gone to great lengths to ensure nothing is forgotten for guests and has established an amazing property. The gardens and lawns are all immaculately kept and a real credit to the management and staff. A nice touch is how they have landscaped the transition from resort garden to natural jungle. It’s a very family orientated place and the charming staff were all wonderful towards our young son and daughter, making them feel very special. The swimming pools are subtly integrated into the landscaping. There is a huge swimming pool with Jacuzzi and children area in the center of the property. The master bedroom has a private pool. A children safety net was provided around the main swimming pool. If you’re a group of people willing to stay together or a couple looking to get married this property is perfect! Beach access was strictly by vehicle via a nice asphalt road with no traffic and the two drivers were always keen to ferry us up and down on request at any time of the day. They were impeccably punctual. Architecturally, the photos of the resort speak for themselves. For a designer, it really is a paradise within a paradise and a credit to the design and planning skill of the architectural and engineering team. Construction and quality are very high and better than other properties we have stayed in Bali. The staff is extremely friendly and they tried to be as professional as possible. The English was a minor issue at times with some staff, but it really wasn’t a problem for us as the villa manager Edy is fluent. He looked after us as a real professional. My personal compliments to him! A special tribute from us to Nyoman the driver is well deserved. He was always patient and on hand to assist us, extremely courteous, great with the kids and always keen to offer information when showing us around his beautiful island home. Food was excellent and we all loved the barbeque! We couldn’t get enough of it! Try the seafood barbeque: no need to go to Jimbaran as you will find much better quality here! Breakfast was plentiful and variations suggested daily by the villa manager Edy. The menu is endless and the suggestions spot on. The pasta Bolognese and Soto Ayam were both excellent. The staff was wonderfully polite and professional. It’s worth mentioning the view again because the dining table overlooks the stunning pool area and green Balinese jungle. Our room was a highlight for us as we had the master bedroom in the property. We had a two level private villa housing one bedroom and en-suite bathroom plus private pool. Entry was from the ground level. The open terrace took maximum advantage of you know what – those stupendous jungle views. The room was spotlessly clean and the bed was extremely comfortable. The en-suite bathroom has a stone bath and outside shower. All rooms have individual air conditioning controls and the system was highly effective. All rooms had ceiling fans also. I saw I pod docking stations in all rooms, TV and DVD player. At all times we felt safe and secure and staff always respected our privacy. If you’re the type that likes night life, you need to rely on your driver to take you to places like Kuta and Seminyak. This was included in the price and we only had to pay for gasoline. Transport was very flexible. When we asked for a tour to Ubud, we simply took the villa car and ordered extra APV’s for the day. The beach close to the villa is Ecko Beach. It’s quite good although its standard is a bit of a step down from the up market feel of the villa. Good for surfing but not for swimming. The lava sand was clean and extended about 30 or so meter into the sea at low tide. Food and drink prices were very cheap, by Australian standards. A short stroll up the beach took us to an outdoor seafood restaurant which was a wonderful experience, eating on the ocean. Good quality restaurants are found in Seminyak, which takes you about 20 – 25 minutes depending on the traffic. Our stay in The Sanctuary was truly magnificent and one to remember. We will recommend it to others – as we have already done with family and friends here at home. Every year we travel with our family to an exotic destination and rent a fully serviced private villa. This year we decided to go to Bali and choose to stay in Villa The Sanctuary Bali based on the pictures of their website. We would certainly return there if visiting Bali with a large group. I hope Frank, Edy, Nyoman and the staff read this because we would again like to say a big “THANK YOU” for helping to make our holiday so memorable.